Michael Cesario leads a session at the DCI Annual Meeting. It's been three decades since there's been such a seismic shift in how DCI drum corps have been judged. This coming June, the ensembles taking the field at the start of the new Drum Corps International season will be competing under an entirely new adjudication system. The proposed system passed by a unanimous vote at the DCI Annual Meetings & Conference Weekend Saturday, Jan. 21, in Rosemont, Ill. After the meeting, Madison Scouts Executive Director Chris Komnick said, "I believe we were just involved in one of the most significant votes in the history of DCI," affirming that this is among the biggest changes in judging since the elimination of the "tick" adjudication system in the early 1980s (when judges were instructed to reward the corps for accomplishment instead of deducting for every individual error). 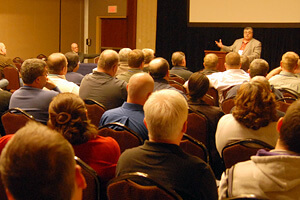 Spearheaded by DCI Artistic Director Michael J. Cesario, the inner workings of the new judging system have been developed by instructors who make up DCI's Rules and Systems Task Force (RSTF), a group comprised of eight instructor members and two advisors, along with liaisons from the judging community. "This new system simplifies the judging sheets so that they are more easily understood by the drum corps community," Cesario said. "It's open to evolve as drum corps explore new developments, including things we may not be able to imagine yet. "The rewarding of achievement is the absolute most important element of the new judging sheets. Performance quality is stressed more than ever." Even after the hundreds of hours of discussion and fine-tuning on this system that has happened over the last 16 months, Cesario says that there's still much work to be done. The next step for the RSTF is to evaluate all of the feedback they've received from instructors throughout this weekend and begin to incorporate those changes into the final versions of the sheets that will be utilized by adjudicators to determine and record their scores. They'll also be working on supplemental materials to augment the new sheets prior to their release to the corps and the general public. Soon, seminars will be held with required attendance for every one of DCI's judges in order to train them on how to use the new system, which will be premiered at the first DCI Tour event on June 16 in Akron, Ohio.